For those who are not looking for unnecessary frills that are found in many washing machines, the MAYTAG MVWC500 can be a good alternative. It is one of those household appliances that promises to be durable, functional, intuitive, and reasonably priced. 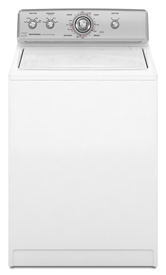 MAYTAG's MVWC500 has the capacity of 3.5 cubic feet. Though smaller than the MVWB400, it still has a super size load capacity. As part of the MAYTAG's line of top-loading washing machines, this washer also benefits from having some of the better features of other laundering units of this brand. This top-loading washer is designed to offer the basics in laundry washing. As such, this washing machine features MAYTAG's DependableClean wash system for better cleaning results, so clothes and other laundry items will come out clean and with a fresh feel to them. The LoadFlex agitator of MVWC500 also contributes to its good cleaning performance. With the trademark commercial technology of MAYTAG, this washer is powered by a commercial drive system and has a stainless steel basket to further seal its durability. Many users have problems with the noise made by their top-loading machines, but because of MVWC500's QuietSeries 100 sound packaging, the washer operates more smoothly without creating too much noise. All in all, it offers up to 16 wash cycles. Another good feature of MAYTAG's MVWC500 is its four temperature settings and automatic temperature control. This helps treat different types of clothing for more thorough washing and rinsing. It also has the standard bleach and fabric conditioner dispensers to take away some of the work from the user. Though not as sophisticated as other washers, consumers can expect durability that allows for longer use and translates to bigger savings in the end -- features that MAYTAG has been known for. There are various benefits consumers can get from using MAYTAG's MVWC500. The features of this top-loading washer are enough to make doing the laundry easier and more efficient. Many consumers have noted how the DependableClean wash system can thoroughly clean laundry items, from little socks to thick bed covers and blankets. Its good cleaning results can be attributed to the washer's LoadFlex agitator, which works better than those of other washers. Many users are happy about its cleaning power that turns soiled clothes to cleaner articles of clothing, with a smooth and fresh feel to them. According to some consumers, this washer is proven to last longer than regular washers from other brands; this can last twice as long as regular washing machines. MVWC500 is ideal for home use and for those who are looking for simple but still efficient ways to clean their clothes. Its large capacity also adds much to its appeal. It can load more and do more washing in less time. Perhaps, this is one of the best benefits from the point of view of the consumers. This washer is not perfect and also has its limitations and share of disappointments among consumers. For one, it has a warranty of only one year. Some buyers have also complained because the washer fill hoses are not included in the package. It also lacks options for the extra rinse and soak settings and doesn't come with warm water option, which could have been very useful to aid the rinse and wash cycles. For its cheap cost, consumers can only expect the basics. The various advantages of having a MVWC500 washer at home outweighs the limitations of using this top-loading washing machine. The features of this product is really appealing than those of other top loaders. It is also a good option for those who need a good laundry machine but are on a tight budget. This model costs about $500, depending on the retailer and package deal. All in all, this washer still offer the basics in good laundry washing. It is ideal for those who are looking far simpler options and straightforward features. One year with this machine and I hate it. Leaves white residue all over dark clothes. Probably on light clothes, too but can't see it. I have called into help line twice, and at their urging tested water temp, switched to Tide. Also washing small loads on HOT and BULKY setting to get more water in rinse. Sometimes..clothes are DRY after going thru entire wash cycle! I now wash only jeans on 1 load, only shirts in another as suggested by their support person. No change..and such small loads..all on HOT with extra rinse kinda of defeats the purpose of high energy. Have photos if you want. Stinky Dirty Clothes after an hour, No Thanks! Ok my husband just went and purchased this washer for our family and I started a load of towels as soon as he hooked it up, excited to try it out. Here's my major concern, the agitation is extremely weak and short, I can't imagine how it is getting the clothes clean. And it took and hour to wash the load. It came out smelling good, but also like bar soap from the shower, which leads me to believe that they are not really clean. So the next load was jeans, dark shirts, and some stinky black socks of my 7 year old sons. The jeans had a little mud on the knees. After the washer was done, set on the heavy duty heavy cycle (with hopes of stronger agitation), the jeans still have mud on them and the socks still stink. So I think my husband will be spending his next day off taking this stinky washer back to the store. No thanks Maytag. This machine is less than 2 years old. I began to notice that after starting the machine (on any setting), a rinse cycle started. Instead of ending on a spin cycle, every time I used the machine it ended on a rinse cycle, which meant that my laundry came out soaking wet. I tried everything. I tried running additional spin cycles, only to have the same problem: every time the machine stopped on a rinse cycle. I had not opened the lid, I had not adjusted the knobs while the machine was in use. There were no kinks in the hoses or water line, and I was following the recommended usage procedures carefully. After contacting Maytag by phone, and realizing that they were unwilling to work with me on a replacement part, I ordered the part from a friend who owns an appliance shop. This person also informed me that this is an on-going problem with this particular machine and that he receives 2-3 phone calls a day about this repair. Maytag has received so much negative feedback online that one customer thinks there should be a recall. I tend to agree. When enough people complain, maybe Maytag will reconsider. We have this washer last year to replace a G.E washer when the transmission went out. We thought a Maytag wwas a good brand. I HATE IT. You can`t adjust the water level , It does it by but the weight of the clothes. It doesn`t get enough water in to get the clothes clean . The wash cycle is to short . Sometimes I wash my whites clothes and towels two and three , they are still just as dirty when I put them in. If I ever buy another washer it won`t be a Maytag. We have had our machine for only a year and a half. We are not pleased with it. 1. It is so loud that we moved our child's bedroom down the hall. It is much louder than our extremely old washer. 2. The cycles do not match the water fill. We have had this problem off and on since we bought it. We had a guy out to "fix" it. It worked for a few more months - just until the warranty was up. Since then, it works sometimes, and sometimes it does not. It begins agitating before there is any water in the washer. It fills with water as the dirty water is supposed to be draining. Therefore, all the dirty water does not get out. But probably the most irritating is that as soon as the final spin cycle is complete, it adds water back to the drum. It does nto fill it up. It just soaks the clothes again making it impossible to put in the dryer. Do not buy this machine. I have read many reviews. Some positive, some negative. Seems like a big gamble to play with so much money. If we had read the reviews first we would have chosen anything else but this dryer. This will be the last Maytag product we will ever own. Just wanted to say that I am pretty content with the washer and one of the issues I have is that I do need to spin the clothes a second time. I don't know if my expectations for dryer clothes is unreal or that top loaders just can't spin out all the water in the first shot. Yes, the machine is loud and crashing but for me having the machines in my basement doesn't create any problems. I am satisfied with the cleanliness of the clothes. They come out smelling great and since I bought the matching centennial dryer, the wash is quick. The dryer is so large, I can't say enough good things about it. In fact, I would rate it a #5. I avoided front loaders after talking to people who purchased them and live in regret. I can't see spending an entire day doing laundry and I hear that the new fangled front loaders take an hour or more for ONE LOAD. I want clean clothes but I do not want to be a fanatic about it. I agree with all the noise complaints, Maytag is surely aware of the problem. The transmission-brake assembly is obviously faulty in these machines. I bought my washer this October and every time I have company and the washer is on I get negative comments about the noise. My favorite is the loud "BANG" at certain times in the cycle. I close 2 doors to the laundry room by the garage and can still hear it upstairs. My last Maytag top-loader worked for 30 years and very quietly compared with this monster. I had to work on it once a year or so the last 10 years to keep it going but nothing major, replace a hose or fill valve but it ran quiet compared to the new ones. If enough people make enough noise to Maytag they may refund our money so we can buy another brand not affiliated with Maytag. Fat chance but worth some emails. YIKES!!!!!! IM SCARED FOR MY SAFETY! THIS THING IS POSSESSED.I AM SERIOUSLY AFRAID OF THIS MACHINE TRYING TO CRASH THROUGH THE WALL AND FLY AWAY! THERE IS SOMETHING VERY WRONG WITH THE SPIN CYCLE. NOT TO MENTION THE NOISE WHEN IT IS WASHING!WOW WHAT A PIECE OF CRAP FROM THE VERY FIRST LOAD.I SHOULD MENTION THE SMELL ALSO. THIS MACHINE IS BRAND NEW. SO I EXPECTED A STRANGE SMELL OR TWO THE FIRST FEW WASHES, BUT THIS OILY SMELL WILL NOT GO AWAY. ITS ONLY GETTING WORSE.THANKFULLY ITS NOT ON THE CLOTHES YET.BOTTOM LINE , DO NOT BUY THIS THING, EVEN ON CLEARANCE!!!! I have had a Maytag top loader in the past. My first one was bought in 1978 and lasted until 2005 (28 years) without one single repair. I replaced it because I was redoing my kitchen. After trying a front loader I disliked the design and opted to got back to a tried and true Maytag front loader. To my disappointment, the MVWC500 is not nearly of the same quality as my old one. It only aggitates in one direction and worse of all it sounds extremely loud. The drive train makes knocking noises and after having my delivering retailer switch out the machine, I found that the new replacement made the same obtrusive noises. Overall, I am extremely disappointed in Maytags inability to address the noise issues in this machine and I am sure that noise reduction insulation could have been added of nominal cost but was passed up on by Maytag. Note in the previous reviews, I am not the only individual to complain about noise with this machine. Please please consider this machine MAYTAG 500 series machine for all of us time pressed working Moms of this world. AND THANK GOODNESS I RETURNED MY FRONT LOADER HE LG machine. I am so much more happier and have more time on a Saturday and weekdays after work instead of trudging to a LG HE front loader washing machine to start up and get frustrated that the electronic timed load is taking so long to complete in hardly any water, just dampness, is not done yet, is not finished, clothes are not moving in the machine and wasting time, OR the clothes coming out are not completely clean, stain s are bright and as fresh as when you first put them into the machine UGG LG HE. I wish to say... THANK YOU MAYTAG. I have my time BACK, I have my life back, I have clean clothes back, and the flexibility to use the cycles as short as I wish in a hurry. I have no grumpy woken up babies or husbands from the LG machine. And for the MAYTAG Noise complaints below please note what the space age new washers like the LG HE front loaders do in comparison..MAYTAG JUST drones as a MAYTAG drones and stops and clicks between cycles and doesn't wake anybody up, it really can put you to sleep with its low droning pitch,lower pitch clicks... WHEREAS the LG HE front loader space age washer, had this HIGH PITCHED alarm clock type electronic end of cycle long extra loud TUNE playing, SO SHRILL and HIGH PITCHED that it woke up the baby and/or sleeping shift work husband in the upstairs bedrooms everytime..so I couldn't wash when the baby or husband was down. With the Maytag..the machine waking up my family members is not an issue nor a no longer a problem. AND because of its cheaper price, I can buy three of these Maytags for one of the LG HE machines that just wasted my time and didn't wash so clean like this Maytag. So I'd rather get a new Maytag each year or every second year if it breaks down, than another LG with plastic parts inside that gets moldy and breaks after 5 five years, on my hands anknees to clean filters and that doesn't clean like my new MAYTAG 500 series. Thank you Maytag for a FANASTIC clean in a short time. You really work hard to get eh job done and does what machine should, save time and labour and get the job done the first time!!! Now with my MAYTAG, bought at a sensible $$price (SALE OF $749.00 (CANADIAN$$) for a washer AND dryer combo together at THE BAY department store), the MAYTAG WASHER delivers practically the same useable tub space for the amount of clothes owned by a family of four, washes out stains in 25-30 mins a load,...who can beat this? These front load HE's sold at inflated $$prices and extra maintenance time, care, and expense has to been done each and every time to prevent mold in the HE front loader rubber door seal and in the HE tub ( you have to buy special tub cleaners ( anti - mold) and run it through every five washes.. is an extra painful time and expense..plus with the LG washer you had to get on your hand and knees and open a drain compartment at the bottom front of the machine to extract a hose and drain dirty water into a bowl and then clean a lint filter, so to reduce the chance of mold accumulating in the washer due to lint residue. What a pain. NOW with my MAYTAG top loader, I no longer have to get on my hands and knees to do this type of maintenance to this expensive HE LG machine. NOW I get to have my simple Maytag top loader that delivers the same functionality in cycle options, tub size, and to boot..I can add laundry booster in the cycle as it goes ( and not just laundry soap as per HE requirements) anytime,and shorten the cylce midway if I need a fresh shirt done in 15 mins with a rinse. The freedom to choose the cycle and its length, and stop the machine to soak if needed, in the middle of the cycle and really get everything CLEAN, unlike the automatic shut down HE machines, where you are stuck watching it sit and do nothing and "rest" the clothes in dampness instead of a decent amount of water to properly clean and get stains out..is true stress reliever for a stressed out pressed for time working MOM and wife. WHO in their right mind wants to pay for a mold potential front loading auto HE machine using very little water and lots and lots of your time, leaves clothes stiff and soapy, stains don't really come out, bending your back machine..when there is MAYTAG 500 series.. this hard working save your back, don't have to buy an extra pedestal expense , no resting in the cycle, gets through it once, fast, high performing machine..with the same useable space for a family of four clothes used in a week with sports acitivites clothes thrown in also, at this great price to boot? I LOOOVE THIS WASHER. The LG Front Loader HE Washer took 5 HOURS to do a hot water load with 2 rinses with enough water ( extra water) to try to get the clean I see with this Maytag 500 machine whereas the LG just couldn't, left stains as if they were fresh. NOW..with my new ..500 Maytag..I get the space to do my King size comforter to clean the first time with enough water in the tub and then super scrubs the Comforter to get off muddy dog paw stains and drool and spilled juice from my kid ( here Mommy, Breakfast!!..SPILL.oops!!) The LG just didn't do it over the displayed time of 5 hours to do the one cycle, which I tried to get the stains out 5 times over 2 days. I returned the LG and got this Maytag 500 and WOW.. This MAYTAG did scrub it all out, all the old LG washed stains that didn't get out and all, the first time, in 30 mins.!!!!!!! My new MAYTAG DOES HAVE A SECOND RINSE OPTION on all FIVE (5) wash cycles,which is comparable to the front loader HE machines, and bought the MAYTAG for a fraction of the HE$$ price: The comparable included MAYTAG cycles to an HE front laoder are: Fast and Heavy in the SUPER WASH cycle of NORMAL, or you can advance directly to Regular WASH in the NORMAL cycle, CASUAL which is the permanent press cycle, DELICATE cycle which is for underwear, and HANDWASH cycle which I use for my daughter cotton bejeweled glued shirts that is the rave with teens. ALL COMES OUT REALLY SUPER CLEAN THE FIRST TIME, NO REAL PRETREATMENT NECESSARY NOR STAND AND WASH UNDER KITCHEN SINK TAP BEFORE USING MACHINE, just dump item into machine, wash with laundry boost or bleach , the machine will do the scrubbing and on top of it, the soap is totally really out with the second rinse option on each cycle. I can now do a complete clean for my six types of wash ALL IN ONE SATURDAY MORNING, just one morning ( whites with bleach; blacks; blues and greens;reds; lights and yellows; towels; bedding/comforters) unlike the LG HE which I could only do two cycles in a morning UGH!! !the LG front loader HE automated cycles took soooo long and didn't get any stains out, I ended up doing washing every day of the week, moreoften redoing items of clothing because it just wasn't getting stains out. OUR CENTENIAL WASHER ONLY 3 MONTHS OLD, AND LIKE THE COMMENT POSTED BY JOYCE, THE WASHER DECIDES IF AND WHEN IT WANTS TO SPIN THE CLOTHES DRY ENOUGH TO PUT IN THE DRYER WITHOUT HAVING TO WRING THEM OUT BY HAND. REPAIRMAN REPLACED TIMER, TO NO AVAIL AND RETURNED TWICE ADVISING WE WERE USING TOO MUCH SOAP, ( 1 oz?) OTHER THAN THAT HE IS AS A LOSS TO EXPLAIN AND CURE THE PROBLEM. IF A CURE IS NOT FORTHCOMING WILL BE LOOKING FOR ANOTHER MACHINE AND DEFINITELY NOT A MAYTAG. I have owned this washer for a year and a half and the gearcase just went out. Since it only came with a year warranty, mine is no longer covered. For the amount of money this part costs to replace, plus the labor to have it installed, I could buy an entirely new washer. Maytag advertises that their products are built to last, but mine was not. I would not recommend this product to anyone. I am not sure why people are having so many problems with this model, but for me it has been great. Yes, it is noisier then most. But being in the basement its really not a problem. Some complain about it walking across the floor when spinning and others that the lid falls down. My suggestions to you is....like all machines you need to put the clothing in evenly so that it spins evenly. As far as the lid falling on your hands, I would say that your floor in not level or the machine itself needs to be leveled, that could also be part of the problem when your machine is in spin cycle why it wobbles and walks across the floor.Sorry for those who have legitimate gripes like a faulty switch, which does happen. But remember folks, a little common sense goes a long ways. makes a horrible thud noise when the drum brake is applied. Do not buy unless you want to wear ear plugs when doing laundry. I have had this washer for 5 months and absolutely hate it. It is unbelievably noisy. My sister came over when it was running and asked "Who is drilling in the basement?" It shakes, jerks and makes loud noises everytime it changes cycles. To get a warm cycle, you have to first have steaming hot water pouring into the washer. The lid continuously falls down on my hands as I am loading or taking clothes out. When I complained after 2 weeks to Plass Appliance in Elmhurst, they told me I could purchase another washer but they would charge me to pick up this one and charge for another delivery, in addition to any extra costs associated with a more expensive machine. i bought a maytag centennial and thought it would be a great washer but it shakes so much it hits the wall. and not to mention it makes the loudest noises when it changes cycles....what a piece of crap. i hate using it! We bought this Maytag to replace the one we bought when we got married 25 years ago. It was delivered in Sept 08 and just 14 months latter the timer is shot. The whole timers is made out of PLASTIC with no metal parts. Tried ordering a new timer for $66 plus shipping and I'm told it's back ordered for three weeks. I think we'll just junk it and get another brand, it's not worth the aggravation of going a month without a washer. My husband just installed the dryer. He became quite annoyed with the installation of the 'legs' of the dryer. Cheap. Did they save a few dollars per machine and gave the consumer cheap parts. So far, one load in the dryer (small load) and 30 minutes was insufficient to dry the load. Not off to a great start. A piece of junk, not the Maytag of prior years. This machine is not yet a year old and has flooded my laundry room a dozen times. Service calls have produced nothing more than stumped technicians. The water is coming from the tub itself and running down the side of the tub somehow. My washer is 9 months old and I have had the repairman out 3 times because the water is not spinning out of the clothes. They replaced pump twice and third time said they didn't know what was wrong. I told them that I could squeeze water out with my hands on some loads and something must be wrong but only got reply that my standards may be too high. No wanting to put dripping clothes in the dryer to me does not constitute "too high standards"
Anybody else had this problem -- the repairman needs help. I recently purchased a Maytag Centennial washing machine. I am very happy with this purchase. I still have an older dryer that works great or I would have purchased a washer/dryer set as I am very loyal to Maytag. I am really liking the new washing machine. I have done over 12 loads of laundry in it so far. It can hold a large comforter very well which is just what I was hoping for. No more laundrymat just for comforters! It is also sturdy enough to handle my bathroom rugs. Such a plus! The Centennial has a stainless steel wash basket. My clothes have come out looking wonderful. The temperature control on this washing machine is also wonderful. I can set a load to wash starting out in hot and ending in cool. This is an amazing washing machine! It is a little bit noisier than my last. I think Maytags are always noisy to some level. Other than that it is working great. My clothes come out so nice and I love that I don't have too rush in to put in the fabric softener. It has a built in dispenser. Makes me feel very spoiled! The dispenser is also for bleach which is great for when my husband does laundry - he can no longer over bleach our clothing! The Centennial also looks very stylish in my freshly painted laundry room. It is a basic white machine with a glass top that gives it a more modern look. I was slightly disappointed in Home Depot - where I purchased the washer from. I was disappointed because they made me pay $20 plus tax for a washer hose that they said I needed to install the washing machine. I had the hose from my mothers last Maytag (hers was only 2 years old) and was told that I had to buy this one in particular. I was told that if I were to use a different hose for installation I would be voiding my warranty.I do not think a customer should have to pay for a part to install their washing machine it should have come with it. I paid $549.00 for the washer, it should have come as a complete package. On the upside there was a rebate. The downside was you had to purchase 2 Maytag products to receive it.